Home→News→USA→Atlantic States→New York→NY elebrate Earth Day on April 22! Many beautiful parks and campgrounds exist throughout New York State, from the shores of Lake Erie to Long Island. 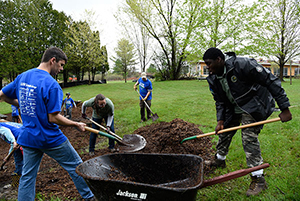 Help keep these special places beautiful by participating in I Love My Park Day, an annual statewide event to improve New York’s state parks and historic sites. Volunteers clean up park lands and beaches, plant trees and gardens, restore trails and wildlife habitat and remove invasive species. Parks & Trails New York, the NYS Department of Environmental Conservation and the New York State Office of Parks, Recreation and Historic Preservation coordinate this event, and park staff and local friends’ groups work with volunteers and oversee activities. Last year, more than 125 state parks, historic sites and public lands hosted I Love My Park Day events.